Although 13 year old Adam Jankelowitz lives in faraway Sydney, when he heard at his school the inspiring story of Capt. Ran Ben Atia of the Nahal Brigade, wounded in Operation Protective Edge, he decided to donate his Bar Mitzvah gifts to Zahal Disabled Veterans. 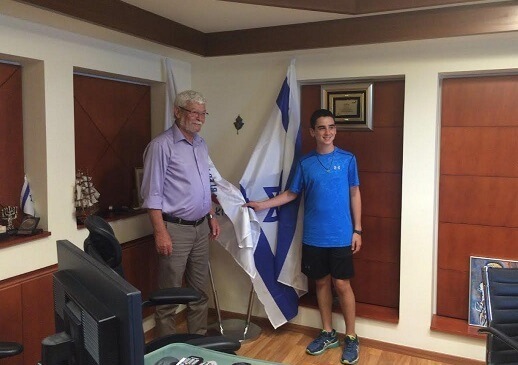 “I was very moved by Ran’s story, he and his comrades defend the country I love so much and they deserve it”, the young Jankelowitz told Haim Bar, Chairman of the Zahal Disabled Veterans Organization (ZDVO), during a visit to Israel. Apparently, he is not the only one who has done this: the Zahal Disabled Veterans Fund which coordinates the work of friends’ organizations around the world, confirmed that in recent years many such youths mostly from Canada, Australia and the USA, decided to make similar gestures. “Despite the great geographical distance, these young people feel a very strong connection to Israel”, recounted Ora Seidner, in charge of Projects at the Fund. “When they have personal, face to face encounters with wounded war veterans who have remained disabled, hear the difficult stories of their injury and the long, complex road towards rehabilitation, they are willing to do everything to support and even engage their families as well”. For Adam it wasn’t enough to donate his gifts, he wanted to visit Beit Halochem with his family and witness firsthand the rehabilitation activities offered by the ZDVO. Haim Bar, Chairman of the ZDVO, admits he found it difficult to hide his emotions. “I meet many good, caring people, who wish to donate and do a good deed, but the encounter with Adam, the sparkle in his eyes, his understanding of the importance of the cause, left me with tears in my eyes”, he said. This past year, the ZDVO’s overseas friends’ organizations have increased the visits which the wounded vets hold at Jewish Schools. “Young people listen to the guests from Israel with great eagerness, said Seidner. “Until now they saw reports on the media and all of a sudden it is very real to them. On the one hand, they understand that a long and difficult rehabilitation process awaits each of the wounded, on the other hand, they are in awe of the fact the veterans want to return to active service, want to realize the dreams they had prior to their injury”. According to her, there are many who decide to donate their Bar/Bat Mitzvah gifts. “We have received donations of toys and games for the children’s play corners as well as equipment for the arts and crafts workshops offered at the Beit Halochem centres. Each such gesture, regardless of the amount or size of the gift, is very special for us”.